Wedding in your not-too-distant future? You may want to check out ReBash, a different kind of wedding market. 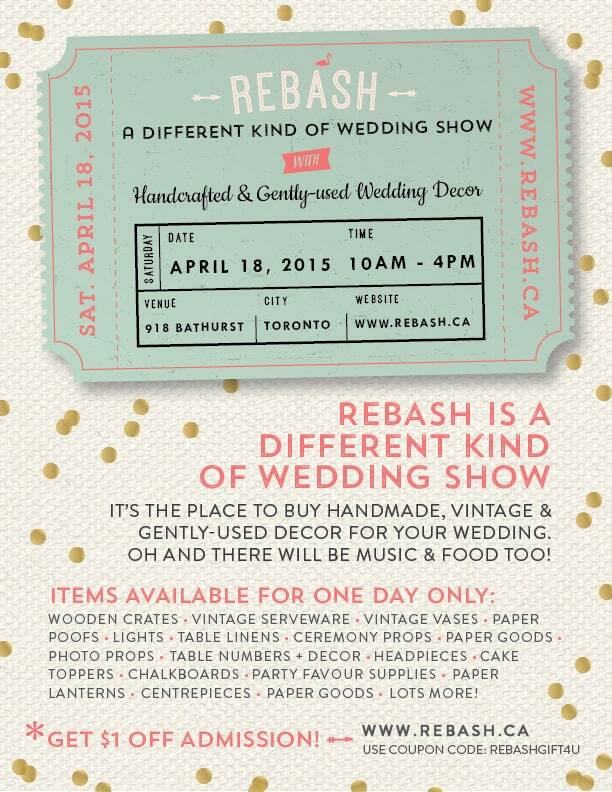 Vendors at ReBash will be selling locally handcrafted, vintage or gently used wedding decor and party props. Guests can shop while enjoying live music, a gourmet sweet table, vintage lemonade stand, workshops, raffles and lots more fun stuff. AND ReBash is donating 20% of ticket sales to local charity Second Harvest. Win-win. ReBash offers something a little bit different than the average cookie-cutter bridal show. Event takes place at 918 Bathurst on April 18th. More details here. Natalie Dawson this look like it might be right up my alley!